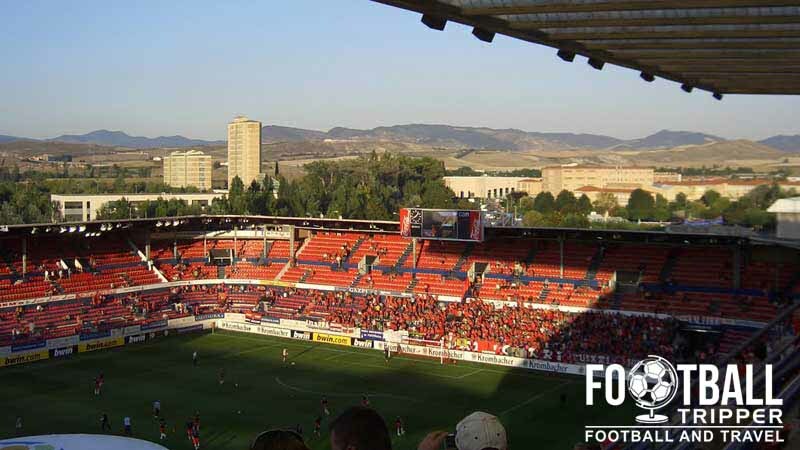 Estadio El Sadar formerly known as Reyno de Navarra between 2005-2011 is the home stadium of CA Osasuna who are based in Pamplona, Navarre. Originally built in 1967, the ground holds 19,553 spectators and has undergone renovations in 1989 and 2003. Built in 1967 to replace the inadequate San Juan Stadium which was sold off to developers, the original 25,000 capacity Estadio El Sadar’s inaugral game was held on the 2nd of September between Zaragoza and Portuguese club Vitoria de Setúbal which resulted in a 1-1 draw. The day after this, Osasuna outplayed the Portuguese side as well, winning their first game at the stadium 3-0 which formed part of a three-way tournament to celebrate the opening. Named after the river El Sadar between 1967 – 2005 and then again from 2011, following a 6 year period of sponsorship from the Government of Navarre who opted to call it Reyno de Navarra which is a medieval term for “Kingdom”. With an opening seating capacity of only 7,000, redevelopment of the stands was inevitable and it has occurred in drips and drabs in recent seasons starting with the main stand being remodelled in 1989 followed by a conversion to all seating, which took the official capacity down by 5,000. Soon, a club shop, office space, scoreboard and boardroom opened in 1999, in addition to two restaurants a year later to increase the commercial viability of the ground. Using the smaller additions to the stadium as a springboard, the club presented their most ambitious plans to date with in December 2006 with the board proposing a new façade for the whole of the stadium in addition to the final pieces of the commercial jigsaw; VIP boxes, and retail space. Boosted by revenue from the council for the renaming of the stadium under the Reyno de Navarra brand to promote tourism to the area the redevelopment was largely a success with a additional income generated through the lease of land to offices, restaurants and shops. 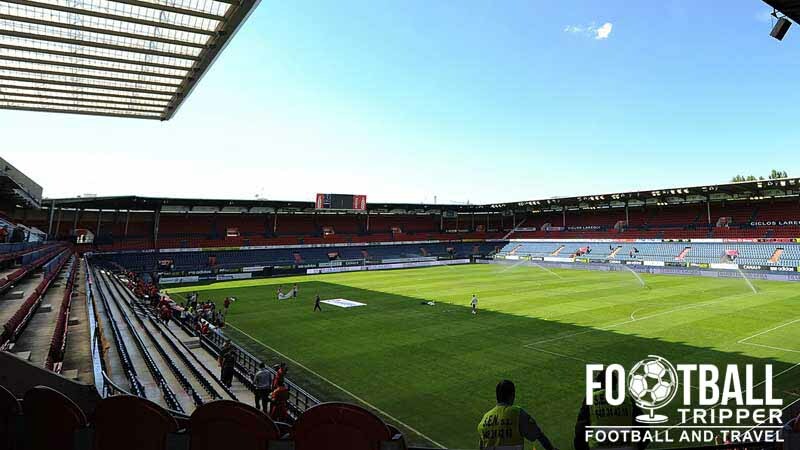 With Osasuna establishing themselves as as Primera Division regulars, it’s only a matter of time before they mount an assault on Europa League places, although they are a long way of this just yet. 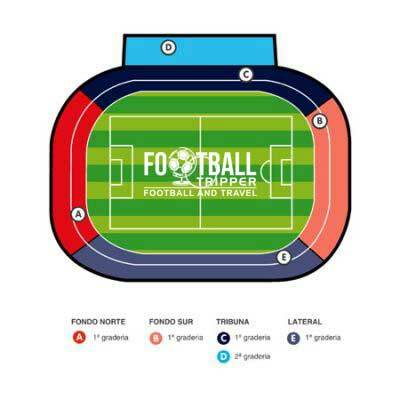 Estadio El Sadar is comprised of four stands: North, East, South and West. Known as Los Rojillos (The little red ones) the club has historically had one of the smallest budgets in La Liga with one report putting their 30 million euros spending power at twenty times less than that of European giants FC Barcelona. The vast budgetary difference is also reflected in both club’s success on and off the field with little old Osasuna’s achievements amounting to runner up in the Copa del Rey in 2004-2005 and participation in the UEFA Cup, 4 times. Fans are very proud of the team regardless of results and 15,000 supporters regularly turn out to cheer on their heroes, with the bigger matches against the top teams in the division near enough sell outs. 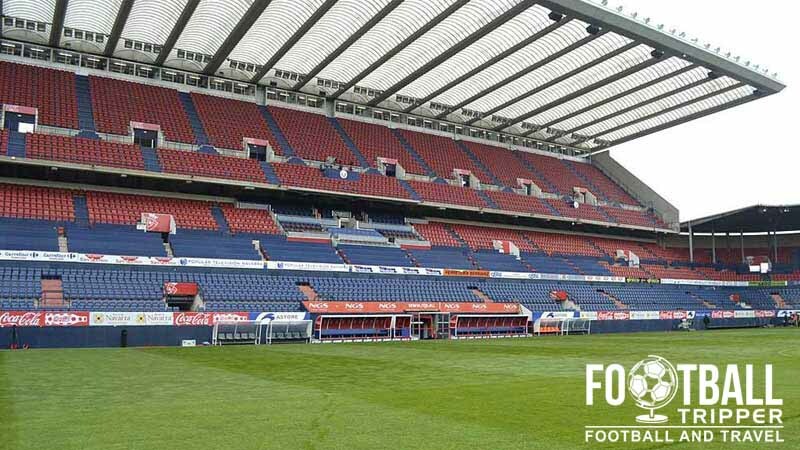 On the last day of the 2013/2014 season, Osasuna fans grabbed headlines across the world when the team took the lead on the final day of the season giving Los Rojillos hopes of surviving relegation. The jubilant fans accidentally caused some of the railing to collapse resulting in fans pouring out onto the pitch whilst some spectators received medical attention echoing scenes of Hillsborough. 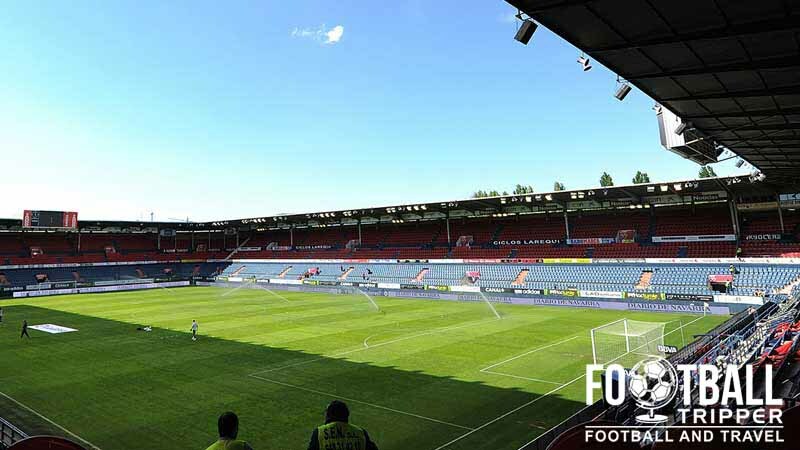 Fortunately disaster was averted, with no fans seriously injured and Osasuna went on to win 2-1 in the match which resumed 35 minutes later giving the team yet another season in the top flight of Spanish football. Despite promises of commercial redevelopment, there really isn’t too much around the immediate environs of El Sadar stadium with the nearby University campus failing to provide any additional options. Still, there are a few smaller places namely El Bodegon del Sadar and Restaurante El Txoko del Sadar right outside the stadium, as well as Casa Albero which promises some cheap looking grub. Travelling back up Avenue de Zaragoza towards the city centre, you will find a wealth of dining options within Pamplona from the International to local cuisine. With Navarra restaurants generally closing at 3.30pm and reopening at 9pm, the area has a real reputation for gastronomical excellence with pintxos aka Tapas being a hugely popular dish worth checking out. Other choices include a “menú del día” which is a traditional Basque txuletón (steak) served with fresh cider (sidra) for approximately 12-18 euros which is a budget friendly choice as well as juevintxo which is a Thursday night special on food and drink, making it a very popular time for locals to socialise after work. According to Osasuna official website there are two official stores located through Pamplona, with the first opening on May 29th 1999 at the back of the stadium. Opening Times: Monday: 16:30 to 20:00. Tuesday to Saturday: 10:00 to 13:30 and 16:30 to 20:00 h. Party Sunday 12:00 h. until game time. Opening Times: Monday to Friday: 10:00 h. to 13:30 h. and 17:00 h. 20:00 h. Saturday 10:00 h. to 14:00 h.
For more information you can always email the club [email protected] or visit the official online store, and remember that official members are entitled to a 10% discount…not that it will much use to you as a tourist! Currently there is no information available for El Sadar stadium tours but if we find out any more information, we’ll be sure to update this section. Tickets to see Osasuna can be purchased Online, or in person at the club shop at the stadium, or any of the other numerous stockists such as Librería Echarte bookstore located at 1 Calle San Saturnino in Pamplona city centre. Tickets can usually be purchased either in the week leading up to the match or on the day of the game depending on how high or low the profile of the opponents is. Price wise, you’ll be looking somewhere between €40.00 to €65.00 for a central seat along the main grandstand and up to €20.00 less for action behind the goal mouths. The stadium is located towards the south of Pamplona off of the easily identifiable avenue de Zaragoza which is one of the main roads leading into the city. It is approximately 2.5km from the city centre and 4km from the main train station. Follow the avenue de Zaragoza southwards and exit left onto Calle Labiano which crosses onto Plaza Gongora which will take you to the stadium. 30-35 minutes should be a reasonable amount of time. There city is too small to warrant taking a dedicated train to the ground but if you are travelling from out of town then the station is generally referred to as Pamplona/Irunya station and is located in the North West of the city centre just beyond Rio Arga river, approximately 4km from the stadium el Sadar. Bus number 11 is your best bet if your starting point is central. Departing from Plaza Pincipe de Viana, leaving every 30 minutes and taking no more than 20 minutes, it really is a convenient mode of transport. Note: Go in the direction of Cordevilla or Parque Comercial Galaria and get off at Sadar stop which is unsurprisngly right outside the stadium itself. Follow the fans! If you are coming from the railway station then you can also take bus number 16 which should take you to Zaragoza stop 84 which is around 5-10 minutes walk from the ground. Impossible to give catch all directions, with the cloest thing being giving you Estadio El Sadar’s address for the Satnav which is: Calle Sadar s/n, 31006 Pamplona. Pamplona has a small domestic airport (Pamplona-Noain) which is connected to the rest of Spain (Barcelona, Madrid etc) via Iberia airline, with the closet International airport unfortunately being either Bilbao (156 km), Zaragoza (170 km), or even Biarritz in France (115 km). Car rental advised if making the journey! The closest hotel is either Hotel bed4U Pamplona, or if you pull, the University. Failing these two options, you’re best heading North to the city centre for the best range of options, with anything South of the stadium being in a pretty poor, non-touristy location. Ppular city choices include Hotel Yoldi, Maisonnave and if you’re feeling flush, Gran Hotel La Perla.